Without science we would know very little about how the world works or about our own nature. However, the greatest value of science is that it gives us so much to think about. This web site is about discovering the power of human thought. What is there to think about? Ultimately, just two things: ourselves and the universe. We are part of the universe, "stardust, billion year old carbon" as Joni Mitchell once sang in "Woodstock". But we are also more than that, or at least we aspire to be. Big Bang Theory  how and why did the universe begin? Time Travel  is time travel physically or logically possible? Meaning of Life  what's the point of living? why are we here? Creation vs. Evolution  are we descended from apes? Artificial Intelligence  could a computer have a mind? Life After Death  what is death and why should we fear it? Extraterrestrial Life  are we alone in the universe? Cultural Relativism  are moral values relative or absolute? Ethical Dilemmas  how do we decide between right and wrong? Social Justice  should the rich help the poor? The big bang theory is the most recent version of a train of speculation about the beginnings of the universe which goes back over twenty-five centuries, ever since the Greek thinkers Thales and Anaximander asked what the universe was made of and where it came from. The concept of time travel has intrigued and gripped generations of readers of H.G. Well's classic novel The Time Machine (1895), an idea developed further by more recent science fiction writers such as Robert Heinlein and David Gerrold. The meaning of life is a question that can occur to us in moments of joy, boredom or despair. Is there an answer to this question, or is the solution to be found in the process of searching? Nearly 150 years after Charles Darwin's explosive The Origin of Species was first published, controversy over creation vs. evolution still rages. Modern day creationists argue that the two views should be taught in schools alongside one another. What do you think? Some scientists now believe that there is a very real possibility that artificial intelligence will be achieved in the near future, and that it will not be long before advanced computers claim civil rights and voters registration. Are those scientists right? And if they are, do you think intelligent computers and human beings deserve to be treated the same? Thinking about death is a great way of concentrating our minds on ultimate questions. Many search for an alternative to the view that death is the final end, believing in life after death. But is that the solution to the problem of our mortality or are we asking the wrong question? Around the world, hundreds of thousands people run the SETI program on their computers analysing data from radio telescopes searching for extraterrestrial life. What are the chances that it will be found? And what would be the significance of the discovery that we are not alone? Two and a half thousand years ago a Greek thinker called Protagoras shocked his contemporaries with the claim that "man is the measure of all things". Today, cultural relativism is taken for granted by many people as a starting point for thinking about ethical issues. Does each individual measure right and wrong according to their own culture and upbringing, or is there an absolute standard of moral value? 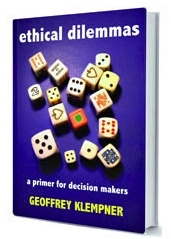 Some see ethical dilemmas as proof that there is no reliable way to decide moral questions. Yet paradoxically, nothing has more power to convince us of the reality of moral values than our own experience of being caught in a dilemma. Under the banner of social justice modern governments have striven to rectify perceived inequality by means of taxation and social programs. Yet some contemporary political theorists see this as not much better than Robin Hood robbing the rich to give to the poor. Who is right? Thinkers have devoted a lifetime to pondering these questions. So take your time, there's no hurry! To help get you started, we have included excerpts from Ask a Philosopher which contains over 2000 questions and answers published on the Pathways web site Enjoy! Many thanks to Ask a Philosopher contributors whose answers are included on The Ten Big Questions: Martina Blumenroth, John Brandon, Steven Ravett Brown, Rachel Browne, Neil Buckland, Matthew Del Nevo, Helene Dumitriu, Tony Flood, Hubertus Fremerey, A. Gatward, Katharine Hunt, Jeffrey Kenton, Simone Klein, Jürgen Lawrenz, Mike Lee, Seamus Mulholland, Ken Stern, Brian Tee and Rich Woodward. This site is brought to you by Pathways to Philosophy the world leading distance learning program run by the International Society for Philosophers. More answers to philosophical questions can be found at Ask a Philosopher and the PhiloSophos Knowledge Base. The latest questions and answers are posted at askaphilosopher.wordpress.com.